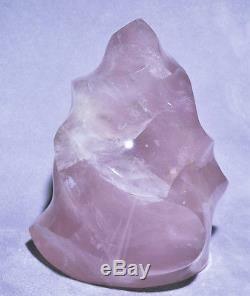 Rose Quartz 7.7 inch 5.31 lb Polished Crystal Flame - Madagascar. All of our crystals are natural and hand selected by our store owner, a 30 year GIA Graduate Gemologist. Crystalarium - True Gifts of the Earth. 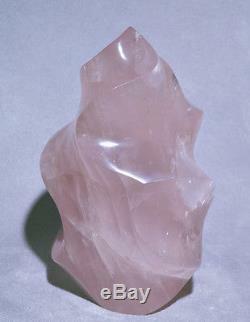 A lovely dusty pink, this polished Rose Quartz "flame" has multiple curves and peaks, like waves on the ocean. The overall form has a beautifully fluid shape, rising triumphantly to a single central point. 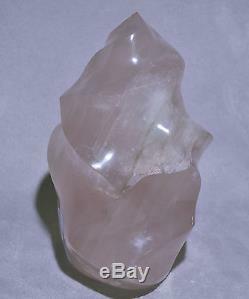 The item "Rose Quartz 7.7 inch 5.31 lb Polished Crystal Flame Madagascar" is in sale since Thursday, October 27, 2016. This item is in the category "Collectibles\Rocks, Fossils & Minerals\Crystals & Mineral Specimens\Crystals".